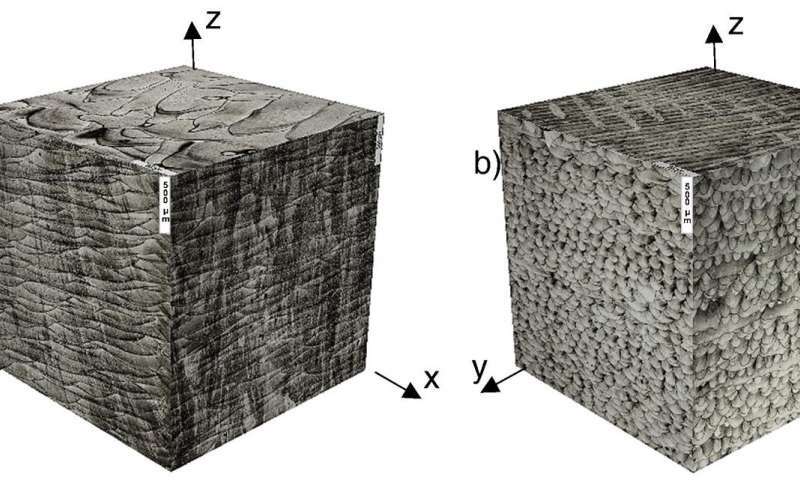 Scientists of Peter the Great St. Petersburg Polytechnic University (SPbPU) and Delft University of Technology developed a technology for obtaining new metal structures using a selective laser melting method, an additive manufacturing technology for making three-dimensional objects from metal powders. Key findings of the research have been published in the journal Materials & Design. With this technology, it is possible to obtain a gradient microstructure and create a product combining the properties of two metals. This material has high performance characteristics such as temperature and pressure effects, strength, durability. "This technology can be used for manufacturing of products operating in extreme conditions including high pressure and temperature," says Vadim Sufiiarov, assistant professor at the Institute of Metallurgy, Mechanical Engineering and Transport SPbPU. "Therefore, this development can be applied for manufacturing of gas turbines for aviation, energy and marine," adds Sufiiarov. Generally, selective laser melting may be used to produce a fine-grained metal microstructure, which provides high mechanical properties at room temperature. However, the gases in a gas turbine engine's combustion chamber have the highest temperature and pressure. The gases aggressively act on the elements of the hot part of the turbine, primarily on blades and vanes, which are responsible for the rotor mechanism. The first and second stage blades have the highest load, so they require a special microstructure. It is either single-crystal (when the product consists of one crystal and one grain type) or directionally crystallized (no grain boundaries in the transverse direction, all grain boundaries located only along the longitudinal direction). With the help of this technology, it is possible to create both equiaxial structures, where the grains have approximately the same dimensions in all directions, as well as directionally crystallized grains, and combine their arrangement in one product. The new approach of additive technologies allows flexible control of material microstructure formation.